Wishing you all a very happy Krishna Janmashtami!! Hindus celebrate the birth of “Lord Krishna” as Krishna Janamashtami or Gokulashtami. 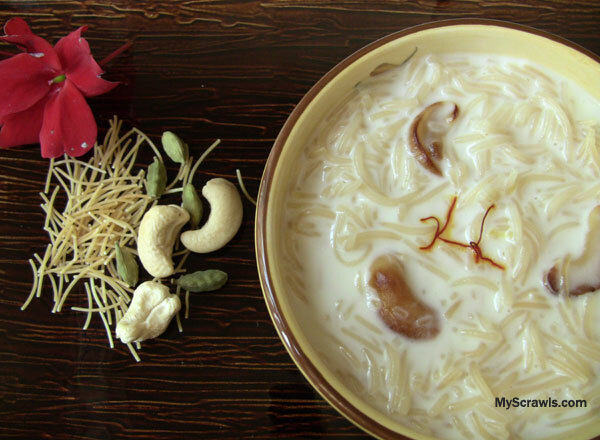 I made this simple semiya payasam (Vermicelli pudding) for prasadam. This is one of the easiest kheer (payasam) recipe! You can make it even more easier by buying instant semiya kheer mix Another way is to (if you do not prefer instant mix) get roasted vermicelli (available in Indian stores). 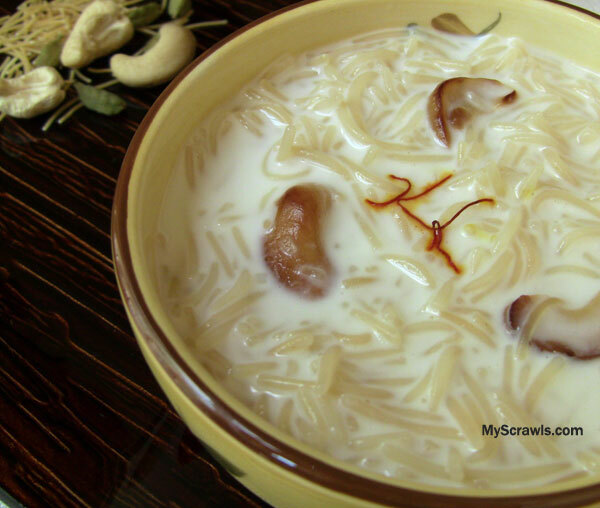 Taste of semiya payasam differs with the variety of vermicelli. Use good quality vermicelli for better taste. I prefer Bambino vermicelli. You can use whole or 2% milk. For thick creamy payasam, use whole milk. Worried about weight gain? Stick to 2 % milk! Sweet toothed? Increase the amount of sugar as per your taste buds! Cashews, almonds, raisins are purely optional. But they definitely increase the taste!! Heat 2 tsps of ghee and roast semiya (vermicelli) till it turns golden brown. Boil water in a heavy bottom vessel. Add roasted semiya and cook for 3-5 minutes. Sim the stove and add 1 cup of milk, sugar and saffron. Allow the kheer to cook for few minutes. Meanwhile heat remaining ghee and roast cashews. Remove payasam from stove top, add the remaining milk and mix well. Garnish with roasted cashews and serve hot/cold. Semiya payasam thickens as it gets cooled. If you are going to enjoy the payasam after it is cooled, be prepared to add more milk! Looks so tempting and delicious. Happy Krishnashtami!! Quick and delicious payasam.. looks perfect ! !